The flight data recorder from an Air France plane that crashed in 2009 off the coast of Brazil has been recovered, officials say. France's Bureau of Investigation (BEA) said the memory unit of the device was "in good physical condition". French deep-sea robots have resumed searching for the airliner's cockpit voice recorder. The Air France Airbus A330 plane went down in the Atlantic on 1 June 2009, killing all 228 people on board. Last week the French search team found the outer casing of the flight data recorder, but not its memory unit. The crucial unit was located on Sunday and delivered to a search vessel. The wreckage was discovered last month after a long search of 10,000 sq km (3,860 sq miles) of sea floor. It was found only on a fourth attempt, using robots capable of operating 4,000m (13,120ft) below the ocean's surface. The Paris-bound Air France jet went down after running into an intense high-altitude thunderstorm, four hours following take-off from Rio de Janeiro. Those on board came from more than 30 countries, though most were French, Brazilian or German. Experts say the data in the two flight recorders is the only hope of finding out why the plane crashed into the sea. The flight data recorder collects in-flight data from the plane's instruments, such as altitude, speed and rudder position. BEA director Jean-Paul Troadec said it would be a great advance if the data remained intact, but the missing cockpit voice recorder - the other so-called "black box" - still contained vital information about the pilots' reactions and "the reasons they took one decision or another". 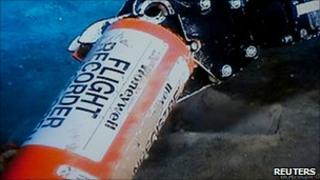 One expert told the Associated Press that the flight recorder data may yet prove unusable, as it was subjected to underwater pressure for nearly two years. "We can't say in advance that we're going to be able to read it until it's been opened," a spokeswoman told the news agency. The data recorder will be sent to BEA experts in Paris for testing.